Sun spots, background redness, and broken blood vessels are the hallmarks of sun damage. This irregular pigmentation causes the skin to appear uneven, discolored, and aged. The good news is that nothing undoes sun damage like IPL. The light energy of IPL targets, heats, and destroys specific chromophores (red and brown pigments) in the skin. Some redness and peeling of brown spots may occur over the week after treatment. Once healed, the outcome is more even and youthful appearing skin. 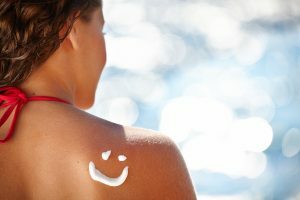 The number of treatments needed depends on the degree of sun damage and skin care practices. IPL must be used with caution in patients with skin of color. It cannot be done on tanned skin. Summer sun causes hyperpigmentation, especially in darker skin types. Whether post-inflammatory hyperpigmentation, sun spots, or melasma, a quick fix is a Spring Street Dermatology favorite – the Vitalize Peel. Vitalize is a blend of alpha-hydroxy, beta-hydroxy acids, resorcinol and retinoic acid that chemically exfoliate the skin. Patients report mild tingling during application. Generally, skin starts to peel approximately 48 hours later and lasts for 2 to 5 days. Most heal fully within 7-10 days at which time skin should appear noticeably brighter. Vitalize is safe in all skin types. A deeper version of Vitalize, called Rejuvenize can be used on lighter skin types for more dramatic results. Plagued by dull summer skin and dark spots? A fall peel is the perfect way to reveal a fresh face. The most common type of precancerous skin lesion is called actinic keratosis (AK). AKs appear on skin that has been frequently exposed to ultraviolet radiation from sun or tanning beds. Previous sunburns or suntans can result in AKs even years later. They begin as small rough spots that are more easily felt than seen. Over time, they can develop into Squamous Cell Carcinomas which have the ability to invade locally and, in rare cases, even spread or metastasize. Most AKs appear in sun exposed areas such as the face, a bald head, or the back of the hands. Finding one AK means that there are likely others under the skin’s surface. Photodynamic therapy is an especially useful tool because it treats both the AKs we can detect clinically as well as the ones we cannot. A medication, called a photosensitizer, is applied to the skin for approximately 60 minutes. Then, skin is exposed to a blue light. The photosensitizer is preferentially absorbed by precancerous cells which then targets them for destruction by the light source. Skin reactions to PDT are directly proportional to the degree of pre-cancerous activity present. Some patients will experience redness, swelling and peeling lasting approximately 3-5 days. The best part is that once the skin is healed, in addition to the obvious benefits in skin cancer prevention, PDT also has cosmetic benefits by evening out skin pigmentation, improving texture, and decreasing pore size. Truly a win-win!